You can visit it here. It has a brief bio and an ordering form if you want to get the hard copy, which I believe will be out on October 7th. It is doing quite well on Kindle and I’m curious to see how many people will want the hard copy. I am hoping that it will make my promotional efforts less burdensome on visitors to this site. I will still mention it occasionally, but there’s enough going on in the climate world that I prefer to focus on it. But here’s the cover again–I like it. 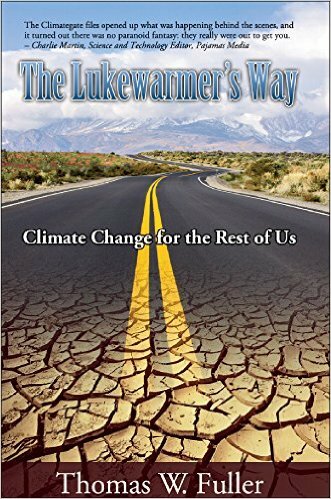 The Kindle version of The Lukewarmer’s Way is now available on Kindle. If you are considering buying it, please remember that early sales are most helpful to an author, as signs of success push a book up the charts and make it visible to other prospective customers. “For myself and those other Lukewarmers I am in regular contact with, our position is not just the adoption of a mid-range between Alarmists and Skeptics. Examination of the data available from the same sources used by Alarmists and Skeptics have steered us to a different conclusion. Climate models have projected more warming than has occurred through 2014. Although they do a good job at charting the broad sweep of climate over the years, they do not get the fine level of detail needed to inform planning. A pause (or slowdown) in temperature rises has occurred just at the time that human emissions of CO2 have exploded. Almost one third of all human emissions have taken place since 1998, but warming has slowed dramatically during that same time frame. This is an argument against a high sensitivity of the atmosphere. Recent calculations of atmospheric sensitivity to increased concentrations of CO2 in the atmosphere are based on observations and provide values for sensitivity that are much lower than previous versions that were based on models. Sea level rise has increased from 2mm a year to 3mm a year in the past two decades. However, sea level rise shows no sign of accelerating beyond that and some indications are that it is returning to the 2mm annual increase of prior years. The physics-based approach to calculating climate change leaves calculations vulnerable to large biological or chemical responses to warming. Vegetative cover on earth has increased by 7% recently—how much additional CO2 will this draw out of the atmosphere? Physicist Freeman Dyson is frankly dismissive of models’ ability to capture the interaction between the various inputs into models. Temperatures estimated from before the modern record do not seem reliable, although part of the problem may be due to inappropriate statistical treatment of the data. Advocacy of an active policy response does not seem to rely on a confident view of science. Rather it suggests that Alarmists rely more on dismissing the opposition as ‘deniers’ and exaggerating the modest findings of climate science, precisely because the results of science to date are not alarming. The physics underlying the basics of climate science are utterly uncontroversial, over a century old and broadly agree with observations. CO2 is a greenhouse gas, it does interact with infrared radiation at certain wavelengths and prevents heat from escaping the atmosphere. Temperatures clearly have risen since 1880 by as much as 0.8C. One of the key predictions of climate science, that the Arctic would warm much faster than the rest of the planet, has come true. Arctic temperatures have climbed by 2C. Sea level rise, almost all ‘steric’ (expansion of the water caused by heat) has increased from 2mm to 3mm per year. Human emissions have grown from 236 million metric tonnes of carbon in 1880 to 1,160 in 1945 to 9,167 in 2010. Concentrations of CO2 in the atmosphere have grown from 280 ppm in 1880 to 400 ppm in 2014. The rate of increase in CO2 concentrations is increasing. The volume of CO2 in the atmosphere grew by 0.75 ppm annually in the 1950s. In the last decade it has increased by 2.1 ppm per year. Growth in energy consumption is skyrocketing with the development of Asia and Africa. My projections show that we may use six times as much energy in 2075 as we did in 2010. Other impacts of human civilization, such as deforestation and other changes to land use, pollution and black soot landing on Arctic snows also contribute to warming. Published plans for construction of renewable energy infrastructure and nuclear power plants fall far short of what is needed to appreciably reduce emissions. Many thanks to the crew at Stairways Press for their work in bringing this book to life.